Chinese turn to online psychology training as box office smash aids resurgence in Austrian's theories. Li Li in Beijing reports. Zhong Juntao closed his living room window, pulled the curtains, put on some soft piano music and laid down on the sofa. "I'm walking down some stairs," he said to himself gently, his eyes closed. "A door opens at the end of the stairs. I see a beautiful seaside beach." The 27-year-old accountant tries to hypnotize himself at least two or three times a week. "I might not be able to have multi-layered dreams like they do in the movie," he said, referring to the Hollywood blockbuster, Inception, "but I want to know more about my subconscious." Although critics tipped sci-fi thriller Inception to fall flat in China, the movie has been a smash hit, grossing almost $70 million by the end of October. Its success came as little surprise, however, to the country's mental health experts. Following several tragedies this year, such as the Foxconn suicides and the kindergarten stabbings, a growing number of Chinese are studying psychology to gain a better understanding of their own state of mind, with many even seeking professional help. The man most are turning to is Sigmund Freud. The Austrian neurologist's 1899 work, The Interpretation of Dreams, is one of two books Zhong keeps readily at hand in his Beijing apartment. The other is Everyday Magic Hypnotism by Liao Yuepeng. "I've started to write down my dreams. Then I try to find an explanation in Freud's book," he said. Freud was introduced to China in the 1920s, when his work was translated by famous Chinese scholar, Zhang Shizhao. His theories fell out of favor during the "cultural revolution" (1966-76) but returned to the public's attention when the country began opening up in the 1980s. Today, his work is enjoying a massive resurgence. In the months after the Sept 2 release of Inception, which stars Leonardo DiCaprio as a man who can explore other people's dreams, Chinese libraries and bookstores reported a sharp rise in demand for Freud's work, as well as that of other psychologists. "Sales of Everyday Magic Hypnotism went up 300 percent a month after the movie came out," said Yang Xiaoye, a public relations officer for Amazon, the online retailer. "The movie has driven up the sales of many books." All 15 Chinese copies of The Interpretation of Dreams kept by the library at Beijing Normal University were loaned in the second half of September. The college has one of the country's finest schools of psychology. "It's rare to see all the copies of a non-textbook checked out at the same time," said Lei Juxia, director of the library's circulation desk. "All the books are on reserve, too." Staff at Tsinghua University's library, which has 13 copies, reported a similar situation, while Freud's works now also hold prominent positions in many bookstores. Even before the boom in psychology that Inception inspired, psychoanalytical training has been steadily growing into a big business in China's major cities. "Search the word 'psychoanalysis' on the Internet in China and you'll find an everlasting list of advertisements for ongoing psychological training," said Huang Hsuan-ying, a Taiwan-born expert in anthropology at Harvard University. "If you do the same search in the West, you'll probably find lots of historical documents," he said. 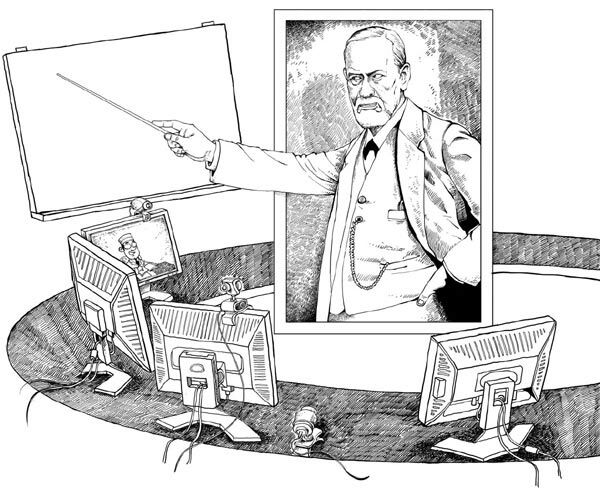 According to Adam Crabtree, vice-president of the Canadian Psychological Association in Toronto, as Freud is now a fixture of Western culture, with constant references made in television shows, books and magazines, people have stopped appreciating his work. Yet, in China his theories are comparatively still new. 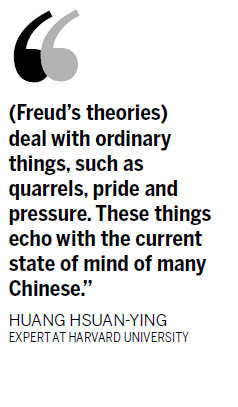 "His psychoanalysis deals with ordinary things, such as quarrels, pride and pressure," added Huang. "These things echo with the current state of mind of many Chinese." Although psychoanalysis is already developed in Asian countries like South Korea, Japan and India, the demand being seen in China today is unprecedented. As a result, the International Psychoanalytical Association (IPA), which was founded in 1910 to advocate Freudian thought, last month celebrated its 100th anniversary by staging its biennial conference in Beijing, the first time it has been held in Asia. More than 600 experts from the United States and Australia, as well as European and Asian countries, took part in 140 panels and workshops over four days. Despite the progress, however, psychoanalysis remains relatively immature in China. The country's standard qualification for psychological consultants, which was only introduced by the Ministry of Labor and Social Security in 2002, is today often criticized. "Anyone who is interested in psychology can sign up for the (national) test and most can pass with less than half a year of rough training," said Yang Yunping, a professor of psychiatry and clinical psychology at Capital Medical University of China, who argued that to become a professional psychologist should require years of hands-on practice. He estimated that the ministry has granted more than 200,000 certificates in the last eight years, although "the number actually capable of doing the job is less than 10 percent". Lu Chengyu, an experienced psychotherapist in Hangzhou, capital of Zhejiang province, said he feels that the fact most psychological practices fail is evidence of the poor level of professional skills nationwide. "Of the 600 students I've trained since 1997, fewer than 50 are still in the business," he said. Lu receives on average three patients a day, but "many new consultants can't even get a client a week", he added. The lack of qualified professionals and the growing hunger among the public for consultation has resulted in greater pressure for China's limited number of mental health clinics. At Zhongshan Hospital in Shanghai, for example, doctors see roughly 20 to 30 people a day. "With that kind of number, we don't really have time to talk to each patient," said psychiatrist Zhang Ronghua. "We just prescribe medication to most of them." International organizations are helping China to train psychologists through several programs, with the main ones run in cooperation with groups from Germany, Norway and the China American Psychoanalytic Alliance (CAPA). Professionals from around the globe offer low-cost or even pro bono guidance to students. The CAPA program has about 50 Chinese students and more than 200 international psychoanalysts and analytic psychotherapists, but what sets it apart is that much of the training takes place through Skype, software that allows users to make online voice and video calls. Instructors in other countries simply speak into Web cameras, with the images broadcast to students' computers across China. "It's a miracle," said Jerome Blackman, a professor of clinical psychiatry at Eastern Virginia Medical School and a training analyst with the New York Freudian Society. "It enables me to discuss psychology with students who are thousands of kilometers away." Although, the method is far from perfect (several consultants in China said they are regularly frustrated by poor Internet connections and technical difficulties), the majority of people involved in the program who talked to China Daily praised the convenience of the Skype-based training. One aspect that has proved controversial, however, is the course requirement that students themselves undergo different types of psychoanalysis, which is also carried out over the Internet. This has overturned the traditional Freudian method in which the analyst and the person being analyzed - referred to as the analysand - are in the same room. "We must respect the limitations of technology," said professor Jose Saporta, a clinical instructor at Harvard Medical School's psychiatry department, who stressed that doing psychotherapy and psychoanalysis over Skype is unlikely to have the same effect as if they are done in person. "There is no simultaneous eye-to-eye contact over Skype," he said. His colleague, Wynn Shwartz, an expert on the supervision of psychotherapy, also pointed out that when technical problems interfere during an online training session and people are forced to repeat things, there is a risk they will change or exaggerate their statement. "This naturally reduces spontaneity, which is what analysts base their judgments on," he added. During the International Psychoanalytical Association conference in Beijing last month, psychologist Xiong Wei from the Wuhan Mental Health Center, one of few Chinese psychodynamic psychotherapy supervisors, released a case study based on 600 hours of online supervision of more than 20 students. "Tiny but important information such as sighs and facial expressions are easily missed during Internet- based therapies," she said before warning that information safety is also a big concern in regards to hacker attacks. For many consultants, however, online training is the only choice. "Do you know how difficult it is to find a supervisor in China?" said Chen Yuying, a psychological consultant at East China Normal University and a second-year student with the CAPA. "Although imperfect, Skype training is better than nothing." There are 108 psychodynamic psychotherapy supervisors in China but no analysts, according to statistics from the Chinese Psychological Society. In the US alone, there are some 3,500 analysts. However, as the central government has just granted the permission for universities to recruit postgraduates in applied psychology, Yang at Capital Medical University said he is optimistic. "Things will certainly get better if we have a strong training platform of our own," he said. "The history of psychoanalysis in China is yet to be written." More international organizations are also looking to get on board, including Lingyu International Psychology Center in Toronto, Canada, which is preparing to launch its own online training program in Chinese. Currently, most international teachers give lessons in English, which some people fear is hampering those mental health professionals who do not have the necessary language skills. Lingyu has promised to provide a translator for all of its training sessions. As for the question of using Skype as a training platform, Elise Snyder, president of the CAPA, answered by referring to Freud's own words. "When Freud wrote to the Chinese scholar Zhang Shizhao in 1921, he said, 'In whatever way you wish to carry out your intention by paving the way for the development of psychoanalysis I will be extremely pleased'," Snyder wrote in a paper presented at the IPA conference in Beijing. "Many of us are following Freud's advice," she added.